What dark secrets is the girl in the ice hiding? As Erika inches closer to uncovering the truth, the killer is closing in on Erika. Crikey! I can’t wait to read The Girl in the Ice, the latest book by Robert Bryndza, who is my guest today! ES: Many congratulations on the publication of The Girl in the Ice and thanks for taking the time to be my Hot Holidays! guest at such a busy time. So tell us, where did you spend your last holiday and why did you choose to go there? RB: My last holiday was to the Island of Krk in Croatia. It was my third holiday there, and we stayed in Baska a beautiful ancient town built by the Venetians. It has one of the longest beaches in Croatia and sits in a bay surrounded by tall mountains. One of the main reasons we’ve been there so many times is the beach. Our two dogs love the sea and we have so much fun with them. The second time we went was during December 2015 where I wrote my bestselling romantic comedy Miss Wrong and Mr Right. 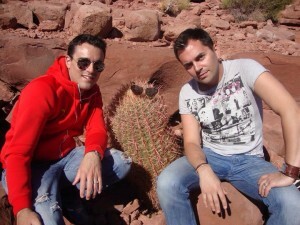 Robert and his husband on holiday with prickly friend. ES: A great place for inspiration, obviously, judging by the success of it! What’s your favourite type of holiday? RB: I love beach holidays. I’m so busy writing whole year that all I really want is a nice relaxing holiday with good books to read. I also love winter holidays. Where I live in Slovakia we have stunning mountains. Every October we go to a place called Donovaly and hire a log cabin for the weekend. We hike during the day, and have a tradition that we watch Prime Suspect by the fireplace, looking out on snowy mountains. I don’t like organised holidays. I can think of nothing worse than being herded around in a big group by a tour guide holding up an umbrella! RB: This is difficult one as I had so many amazing holidays. As I said earlier I love Croatia. I also love the Greek Islands and Italy. Rome is the most beautiful city in the world and I had the best time there. One of the best holidays I ever had was in Greece on the island of Kefalonia. It was so relaxing and stunning. We drove around the island on the serpentine roads stopping off at Myrtos beach, the Melissani caves, Fiscardo… But I have to say one of the most beautiful places I have ever seen has to be the Grand Canyon, which is totally breathtaking. ES: I can’t disagree with that! Have you ever had any holiday or travel disasters? RB: In 2010 I applied for a US visa and stupidly didn’t take all the correct documents to my interview at the US Embassy in London. I was told politely that I had been turned down for a visa. I didn’t think much of it, and got my visa a few weeks later with no problem. When we flew to America I had to tick on the immigration form that I had been turned down for a visa and when we arrived at Immigration I was whisked away and detained in a room with suspected terrorists, people with arrest warrants. My husband wasn’t allowed to wait for me, and I was held for 4 hours and questioned. It was awful and really ruined our holiday. ES: Oh, dear! On a happier note, tell us about a place you long to visit and the reasons why. RB: There is one place I would really love to visit and that’s Iceland. I would love to see the geysers and all the stunning nature Iceland has to offer. RB: It’s my husband. He loves travelling and adventures (sometimes too much) and most importantly he is an amazing packer! I just pick up my passport and everything else is ready. I don’t think I would enjoy traveling on my own. ES: Have you ever had a holiday romance? Details, please! RB: Yes. When we were in Kefalonia there are so many stray dogs. They are all so beautiful and tame and we adopted one caramel coloured mutt who didn’t leave our side. He came to the beach with us and we found him several mornings waiting outside our apartment. We called him Zorba, and wanted to bring him back with us, but at the time we lived in a small flat and already had two dogs. It broke our hearts to leave him. ES: Aww! How would you spend your dream twenty-four hours if you could travel to multiple, worldwide destinations with no travel restrictions? RB:Who’s paying? 🙂 I would go for gorgeous Greek breakfast by the sea in Kefalonia; Feta cheese baked in pastry and drizzled in olive oil and sesame seeds. Then I’d go for espresso at Piazza San Marco in Venice, than I would pop for lunch to Piazza Della Rotonda in Rome, which overlooks one of my favourite buildings in the world, the Pantheon. Around 4pm I would be peckish so would have a little snack in Prague by the Charles Bridge and I would love to finish my day by watching the sunset in Dubrovnik. RB: Always get travel insurance, take plenty of books and sunscreen, and when choosing your travel destination always follow your heart. Thank you so much, Rob! Good luck with your book, and happy travels! And, if you would like to know more about Robert, please follow the links below.